In September 2016, I had the good fortune to attend the Dharma Assembly of Empowerment by Guan Shi Yin Bodhisattva’s Mind of Great Compassion held at Hua Zang Si in San Francisco. Abbot Dharma Master Ruo Hui was in charge of the mandala to lead the dharma practice. 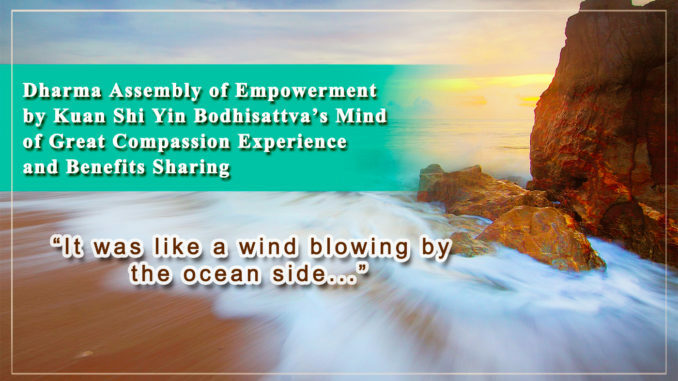 Earlier, I read the report about the dharma assembly of empowerment by the greatly compassionate Guan Shi Yin Bodhisattva held in New York ten years ago and thought that such a dharma assembly must be very uncommon. I could not have imagined that now I myself had the karmic condition to attend this dharma assembly. My heart was very excited. I am extremely grateful to the empowerment from H.H. Dorje Chang Buddha III and the greatly loving and compassionate Guan Shi Yin Bodhisattva! I thank the dharma master leading the dharma practice! At the start of the dharma assembly, Dharma Master Ruo Hui described the expected situation of the dharma assembly as well as the noteworthy issues to the monastics and laypersons present. Regardless of what might happen around us, we should always maintain a peaceful mind with good confidence. We should know that we would be under good protection. Also, there were fellow brothers and sisters serving as dharma protectors at the site. Then we chanted mantras together. The sound from everyone’s voice was not only in unison but also very pleasing to the ear. The sound of mantras was like an enchanting music. After that, we adjusted our bodies into the desired posture as instructed by the dharma master and closed our eyes. The entire crowd was quiet, and the process of empowerment started. After about one minute, I felt a breezing wind blowing over. The feeling was quite obvious. Then the force of the wind became greater and greater. It was like a wind blowing by the ocean side. My arms began to swing spontaneously. My feet was also trembling. I felt that I became very light, as if I would be blown up by the wind. Later the power of the wind gradually reduced, and I could once again stand firmly on the ground. After that, I kept that posture throughout the dharma assembly. There was one moment when my thighs had a very refreshing and cool feeling. During the dharma assembly, I heard the sound of patting the body from other brothers and sisters. Some of them were speaking. Some sang songs. Some others were dancing. Some attendees laid on the floor, and some of them were rolling on the floor. Some fellow brothers and sisters performed mudras in the process. When we shared our experiences after the dharma assembly had ended, I learned that each person generated different manifestations from his/her own sensation and response. All received empowerment. The occurrence of the above situations in the midst of the dharma assembly made the process quite bustling. I tried my best to keep my mind from being interfered. Actually, the strong and powerful empowerment made me feel that my heart was very pure and tranquilized at that time. I was truly better calmed than when I was in my normal sitting meditation. There wasn’t much illusory thought. After fellow brothers and sisters shared their own experience from the dharma assembly, we immediately went to a small town by the ocean side to hold the ending practice of releasing living beings from captivity. When dharma water was sprinkled to the little fish and crabs in a water pool, they were all jumping actively. We could see that they were very excited. Then we all followed a queue to take turn to release them. They were very delighted to return to the ocean. At that time, there were no seagulls present to disturb them. Everything was very perfectly accomplished and successful! On the day before the dharma assembly, I was stilling having a flu. When the empowerment dharma assembly ended, I felt that my nose was no longer stuffy. My breathing was smooth and free of obstruction. My brain felt fresh. I was filled with the joy of the dharma! I am grateful to the empowerment from H.H. Dorje Chang Buddha III and the greatly loving and compassionate Guan Shi Yin Bodhisattva! I thank the dharma master leading the dharma practice!